Scrapbook Floral Tree PSD - Free Photoshop Brushes at Brusheezy! Looking for a fresh new scrapbook page design? Check out this new Scrapbook Floral Tree PSD! This floral tree PSD has it all - buttons, flowers, leaves, and even stitched ribbon bows. You'll love the stitched edge border on this scrapbook floral tree PSD. 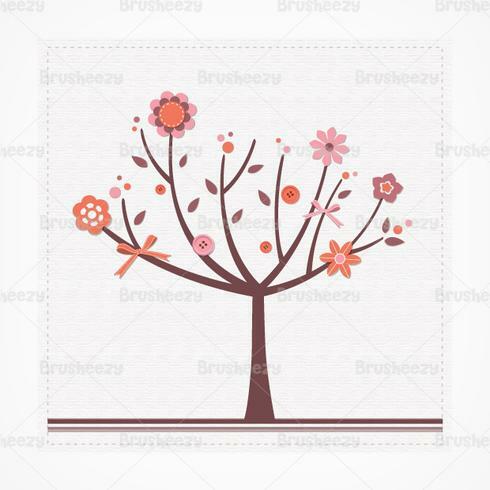 Also check out the <a href="http://www.vecteezy.com/backgrounds-wallpaper/59735-scrapbook-floral-tree-vector/premium">Scrapbook Floral Tree Vector</a> over on Vecteezy!